Home / The Buzz / 10 Q’s With Guru! Autumn is upon us! It feels like this year is going so fast!! One of the most exciting things about 2017 has been finding Guru Pet Food. When we launched our blog this past February Guru was one of the first companies to work with us and I credit much of our success to their undying support! Amelia has of course gone topsy turvy for their Surft & Turf recipe… not to mention the sausages !! Who are the Geeks behind Guru? We’re a family owned business, founded by Lisa & Andrew. We have a team of Geeks behind the scenes who each play an important role to ensure you and your furiends enjoy a GURUvy experience! You’ve probably seen some of the Geeks (Sam, Steph, Corinne & Laura) on our ‘@theoriginalgeeksters’ Instagram page, we’re always up for a chin wag, fun and a right good giggle! What’s the magic behind Cold Pressed dog food? Having checked the dictionary definition of ‘magic’ we’ll take it that you mean fascinating, irresistible and captivating… Haha! On a more serious note, by producing complete dog food using the cold pressed method, we retain all of the ingredients flavour, aroma, vitamins and nutritional value. Therefore, providing a naturally nutritious and balanced diet for your four legged friend. It’s been two years since Guru was born, what’s been the biggest surprise over these two years? The biggest surprise is that Guru launched two years ago, where does time go? It feels like we’ve achieved so much, in such a short time. You have quite the clientele! Everyone is drawn to Guru, what do you think draws people to you? Yayyy… shout out to the #GeeksterSquad. All of our Geeksters are part of the Guru Family and we really mean that! As you’re aware Eva, our hashtag from when we first launched and which we still use today, is for us all to #SpreadTheLove. It’s an incredible feeling to know that our Geeksters believe and feel the same way! What inspired your recipes Surf & Turf and Full on Feast? An absolute love of food!! Surf and Turf is our original recipe and the inspiration for this came from Lisa’s favourite dish! Lisa couldn’t find any Surf and Turf recipes for her dogs on the market and wanted Gino and Duke to join the pawty. Our Full on Feast recipe was inspired by feedback from our customers who wanted a Grain Free recipe. Our Duck recipe is the only Grain Free cold pressed recipe on the market. Our customers ask and we always listen! Venison sausage treats are your newest product launch! Could you tell us more about them! SAUSAGESSS…! Geeksters just can’t get enough of them. Our Nothing to Hide sausages are made with quality ingredients and are naturally air-dried to lock in all of the goodness. They’re made from 70% British Venison, sweet potato and apple and they smell de-lish. They’re also perfect for training and popping in your pocket, if you’ve not tried them… what are you waiting for? Could you tell us a fun fact about The team at Guru that no one else knows about? What’s a typical day like at the Guru HQ? 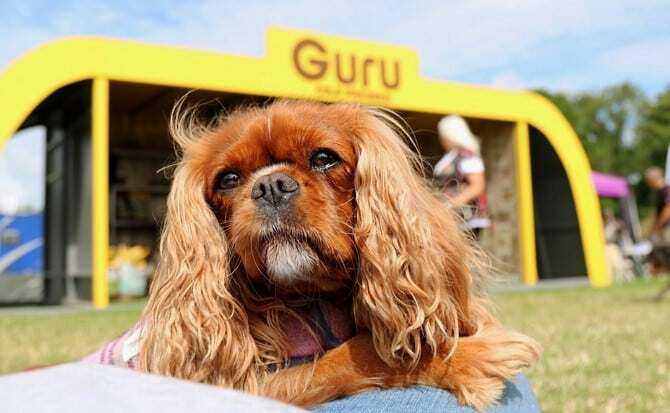 Where can people buy Guru pet food? The majority of pet parents buy Guru online, as it’s super convenient and we offer free delivery on all orders over £50.00. Having said that, we stock our products in select pet stores around the UK. So, if you still like shopping old school and you want to pop into a store, you can give us a call to see if there’s a store local to you. What’s in store for Guru this coming year? Now that would be telling… Haha! What can we say! We are head over heels in love with the Geeks behind Guru !